In this Destiny 2 Damage Types and Weapons guide we’ll explain how enemies and weapons have different damage types. We’ll explain how this corresponds to their Arc, Solar, and Void damage type, and look at Kinetic damage. In short, this Destiny 2 guide will explain what the orange, purple and blue shields mean that you see around certain enemies, and how best to deal with those enemies. For more on Destiny 2, check out our Destiny 2 Guide Hub and Walkthrough. It’s got all you need to know about the game, including walkthroughs, exotic weapons and armor, strike guides, and more. Destiny 2 Damage Types - What do the Colored Shields Mean? Here we break down the different damage types in Destiny 2 and explain what each enemy shield color means. Read on and you’ll know what weapon types to use against each enemy shield color. This wizard has a solar orange shield, so is weak to a solar weapon. Simple! Kinetic - This is white and is the default for the majority of weapons in Destiny 2. It has no bonus damage to any enemy. Solar - This is orange and causes Solar damage. It causes more damage to Solar enemies who have an orange shield. Arc - This is blue and causes Arc damage. It causes more damage to Arc enemies who have a blue shield. Void - This is Purple and causes Void damage to enemies who have a purple shield. These element types apply to enemies, enemy weapons, guardians (your subclasses) and your weapons (including melee, super and grenade attacks). In certain missions in Destiny 2, Burn Modifiers will be active. These essentially double the damage you deal to enemies of the damage type being modified. It also works for enemies, but they get an increase up to 300% damage for the specified damage type. 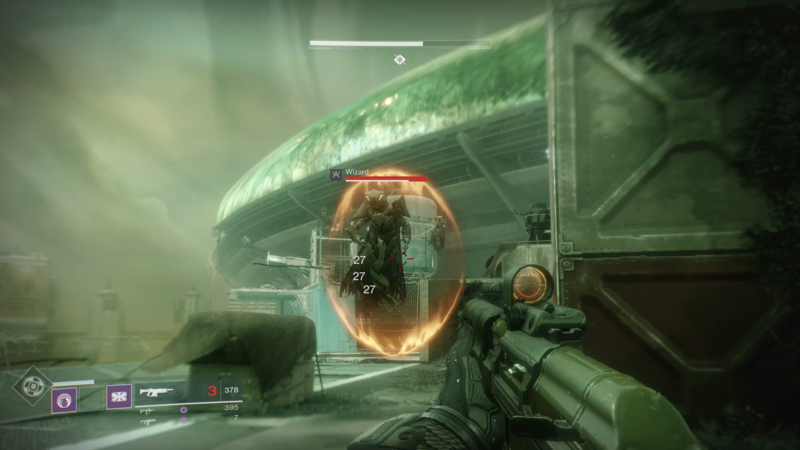 You can see a Burn Modifier in action on the Nightfall Arms Dealer Strike.